Size (mm): 12" * 8"
Size: Saucepan W / Lid 18 Cms. - This katori from Sage Koncpt has an elegant design with leaf designs finished in golden colour. The katori can be used to keep dry fruits or snacks, and can also be used as a key bowl or decor item. The bowl is made of stainless steel and has a silver finish. Offering you a complete choice of products which include Storage such as Square Containers, Modular Containers, Rectangular Containers, Microvent Containers, Autumn Containers, Masala, Spice & Condiments Container and many more items. Laddle : A wide flaring mirror-finished pattern, 9 Inch Serving Tools combines clean cut and beautiful shape along with robust construction. We manufacture Brass & Horn / bone cutlery sets which are easy to clean and maintain. These are available in different shapes and thus meet the requirements of traditional as well as contemporary kitchen. The range is extensively used for slicing & dicing and can be customized as per clients specifications. The large Serving Ware in a set of three are the perfect size for serving different delicacies on occasions. 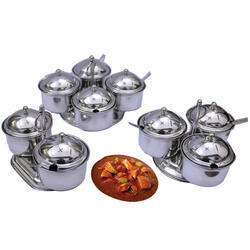 Besides, these bowls can be put directly into the microwave ovens to warm the dishes and to serve them hot. Our team of professionals has beautifully carved our products with attractive designs and patterns. Our range is very convenient to use and touch. Our innovative products find its applications in houses, hotels, restaurants and canteens.